Several Israeli military ships attacked, Wednesday, Palestinian fishing boats, near the shore in Gaza city. Media sources said the fishermen were taken prisoner while fishing in Palestinian territorial waters, in front of the Shati’ refugee camp, west of Gaza city. They two were placed in a navy ship, before they were moved to an unknown destination. 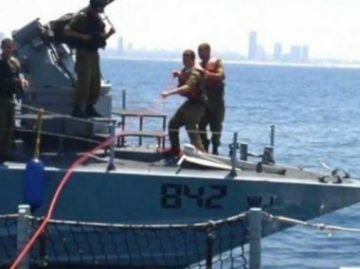 On Tuesday, the navy stopped a humanitarian flotilla from the Gaza Strip, nine miles from the shore of Gaza, and later released them. On Wednesday at dawn, the soldiers abducted six Palestinians, including a father and his son, in the West Bank governorates of Ramallah and Hebron, during extensive military searches of homes. The Palestinians, who were abducted in Hebron, were taken during an extensive Israeli military campaign, targeting dozens of homes and buildings, in several parts of Hebron governorate, in which the soldiers also confiscated a car and a mobile phone.